Available for the First Time Ever! Early Los Angeles Vital Records! This groundbreaking work is the first volume in a series which will eventually cover Los Angeles County from 1850 to 1889, a period in which the public recording of vital records was incomplete. Each successive volume will cover one decade. Volume 1 includes data on Orange County, which was then still part of Los Angeles County, and parts of Kern, Riverside and San Bernardino Counties. 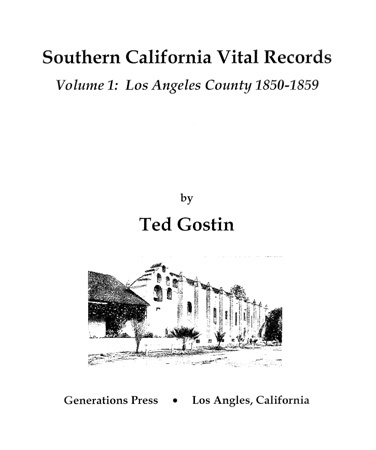 Data in the first volume was compiled over a three-year period by the author, Ted Gostin, a professional genealogist in Los Angeles with over 20 years experience researching Los Angeles County records. There are separate chapters for Births & Baptisms, Marriages, and Deaths and Burials. Each chapter has introductory comments, followed by the indexes themselves. 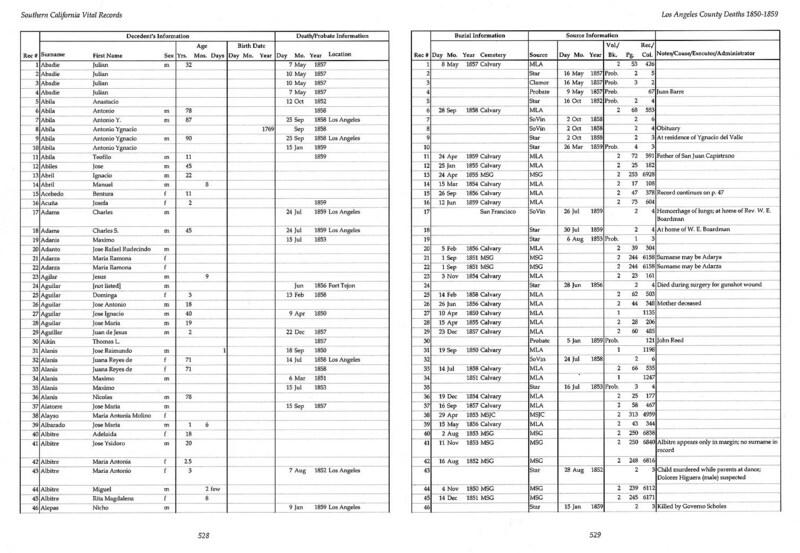 Each index is presented in tables on two facing pages. Information on the participants in the event is presented on the left-hand page, while dates, source information and comments are presented on the right-hand page. Entries are numbered consecutively and record numbers are presented on both pages, making it easy to track one record from the left-hand to right-hand page. The birth and death indexes are presented in single, alphabetical lists, while marriages are presented in two alphabetical lists, one for both brides and grooms. Order Your Copy Today for Only $49.95! This work will be valuable for both genealogists and historians. It is a "must-have" volume for genealogical libraries, historical societies, and serious Los Angeles genealogists. You can order your copy now, by printing out the Book Order Form, completing it with the information on the right, and mailing or faxing it to us with your payment. You may pay by check, money order, or PayPal (for Visa or MasterCard orders). All orders must be prepaid in full; no books are shipped on the basis of purchase orders. Order today, and add this valuable new work to your library! A thorough explanation of the New York customs and immigration passenger lists and their indexes. Illustrates how to use the available indexes, describes their limitations, offers strategies for searching in unindexed years, and shows how to use the index information to find the actual passenger lists. Also describes the process of creating both the lists and the indexes, and debunks numerous myths about the passenger lists. Genealogical Resources in Southern California, by Ted Gostin. A detailed guide to genealogical research sites in Southern California, with the emphasis on Los Angeles County. Includes libraries and public records offices, with separate chapters on each research site and research subject area. Russian Genealogical Resources in American Repositories, by Ted Gostin. Genealogists researching Russian roots have long been frustrated by the relative absence of Russian genealogical resources available in the west. This book reviews the resources from the Russian empire that are currently available, and those that are now becoming available. The topics covered include vital records (in both Polish and Russian formats), revision lists (tax censuses), Russian business and city directories, the Russian Consular Records, Russian newspapers, passenger arrival indexes, maps & gazetteers, collected biographies, encyclopedias, Internet resources, and genealogical societies. Under each of these topics, the book will have special sections on Jewish-Russian resources. The Shtetl Atlas, by Ted Gostin. A compilation of street plans of Eastern European shtetls, the small Jewish towns made famous in Jewish literature and folklore. Using information from a variety of sources, including published maps, yizkor (memorial) books, encyclopedias, and gazetteers, detailed street plans of over 400 shtetls are planned. Each map will be accompanied by a page of basic information about the town and its Jewish community, including a town history, population statistics, prominent personalities from the town, and its history during the Holocaust. Generations Press accepts payments by check, money order, and PayPal (for Visa and MasterCard orders). To order, simply print out the book order form, fill in the items you wish to purchase, include your mailing address and payment information, and mail the form to us. Orders are shipped within one week of being received.